Being Gluten-Free Vegan: Kale Chips! 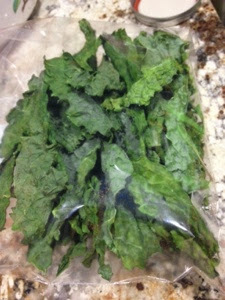 I made kale chips in the dehydrator! I put them in at 125F for 3-3.5 hours. When they were done I put some Redmond's Salt and Cayenne pepper in the bag and shook it. Next time I will add seasoning to it before I dehydrate. I also want to try to make "cheesy" ones.